We are blessed to re-visit the awesome Calaveras Big Tree State Park, in California. We spent a couple of days here, many years ago, on our way to Yosemite National Park. This time, it was even more relaxing, and with the motorcycle, we were able to explore CA 4, which was an exciting ride. We ran, full speed, from the cold in Carson City, Nevada, and didn’t look back! I hope we can go back again someday, but with a warmer rig or warmer weather! We were advised not to take Ebbetts Pass (CA 4) to Calaveras with our van and trailer rig, so we set the GPS for Placerville, CA and headed in from there. This proved to be a nice drive, a semi-freeway, mingled with two and four lane roads. We went through Lake Tahoe, never spotting a welcome to California sign! We arrived at Calaveras and set up camp. TWICE! Between picking a site and then paying, we did not realizing the first site was reserved…oh well, we ended up with a great site all the same. Calaveras Big Trees State Park, CA. Still jacket and hat weather, but no signs of snow! Motorcycle Ride! We finally were able to get back on the bike, and took a ride back towards Lake Tahoe, on the the road we didn’t want to tow the trailer on. It was perfect temps for a ride and this is absolutely a bucket list place for riding. The road does go down to almost one lane, for a good portion, and I have never been on a 24% grade road before! No smoking brakes for us! We took a short lunch break and checked out this National Forest Campground. Yes, that white stuff is snow, but I didn’t see any mosquitoes! We spent Saturday evening around the campfire of B.J. and Karen, from Santa Barbara, CA. They just returned from a trip to Alaska, and shared their experiences and tips with us. Another item to add to the bucket list! Other Saturday sights were this blue jay and the meadow near the camp sites. Sunday, we walked the North Grove, which is an easy paved 1.7 mile loop, close to the Park entrance. Then we rode the motorcycle across the Park, which is about ten mile (one way,) and a fantastic ride to the end of the park. The great views and quiet road, led us to the South Grove trail. This is a five mile loop hike to the Agassiz Tree, the largest Sequoia in the park, through a few other rather tall trees. As we came out at the end, there was a small gathering of people, watching us come up from the trail. It seems the rustling in the bushes was a bear! Unfortunately, we didn’t get a pic, but, we didn’t have an up-close encounter at the creek, either! South Grove Trail. The five mile hike, which we did in the late afternoon, was not overly difficult. A nice sunset view of the creek. We had a great visit at Calaveras, you need to rest up PopPop…we are off to visit the grands tomorrow! Get there before the cold sets in, and our Florida blood wouldn’t want to be there! We did nine states in five days. The places we passed through so quickly are wonderful, but will have to wait for better exploration on a future trip. Here’s a quick overview of our travels North. Spent one night at our place in Umatilla, to mow the grass, and stretch our legs. 2016_09_15 Marianna, FL, Florida Caverns State Park. Don’t see this at home! City folk aren’t sure just what it does, but it looks like fun! We’re not in Florida any more Toto! I got flowers, aren’t they pretty! The Captain has grown up to be just like Captain Jack! Beer-thirty will never be the same! Nyah is the best navigator ever, always on watch to keep us on course. We saw this sign on our way out of town, we didn’t stop, but we loved this area and hope to come back and spend more time. Yes, there is an app for that and we use it on long travel days. We pick a place a gazillion miles up the road, search for a Walmart that allows over-night parking on the app. Read the reviews. Pull into the parking lot very late…argue a bit about the best place to park…because by now we are very tired…lighted area…not next to that car or trailer (they look dangerous.) And once the spot is picked, move the dog’s bed and lock ourselves in the trailer and go to sleep. I must stress this is a 24 hour parking lot, not a camp ground, so there is usually a bit of movement and commotion around and about, not for the faint of heart! But it’s a working relationship because we can get ice and any forgetten groceries and be on our way early in the morning without having to pack up. 2016_09_18 Canistota, South Dakota, Vermillion State Park. Here are a few other pics along the way. Sorry for the bug splat, but the open road is awesome here! We made it! Next stop, Badlands National Park. Thanks for following along with us, we can’t wait to show you how beautiful South Dakota is. And as always, we hope you are inspired to plan your get-away. We have tied No Ka Oi up to the dock and stepped back onto dirt for a few months. The Captain had the cogs in motion for a new adventure, even before we coiled the dock lines and unpacked the fridge. We needed a road trip. It should include the motorcycle. It should be low budget, cause that’s how we roll. Camping. Adventure. Two crazy people willing to try just about anything once. That’s us! We plan to visit friends and family, as we make our way from Florida to California, pulling our new trailer/toy hauler/mini camper. We plan to make as many stops as we can squeeze in, while we take our retirement adventure to new places. But, first we had to get our short, short camper. We went trailer shopping. After looking at a bunch, we decided on one from Indian River Trailers, in South Vero Beach. The quality of their trailers became obvious compared to the others we looked at, and they aren’t shipped in from another state, but made right on site. Our baby was in the bay getting her final touches, and we picked her up the next afternoon. In addition to quality, our goal was to get the smallest trailer which could carry the motorcycle and also give us a bit of camping space. Repurposing everything we could from our formidable collection of stuff, because that’s how you keep the budget low, we spent several weeks getting her ready to roll. Welcome to the Short, Short Trailer goes on a Long, Long Trip. Incase you have never seen Lucille Ball and Desi Arnaz in a Long, Long Trailer, this is the clip that describes us best. Lacey has nothing on us when it comes to rock collecting, here’s a sample from our last trip to North Carolina, and this doesn’t include the ones we used to build a waterfall in our atrium. Our jeep was “weighted down,” to say the least. We aren’t about to do that on this trip! I hope!!! We were weighted down with necessities, so the Captain added new shocks to our van, then we had to test the load. We made a weekend trip to the Keys, to catch up with friends. 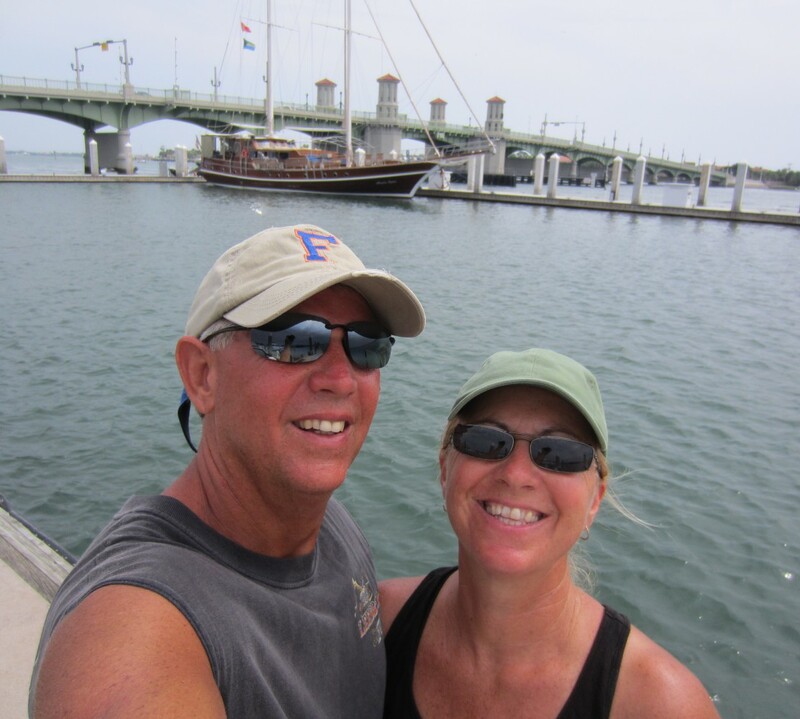 We had a great afternoon visit with Captain Jack, Cheryl, and Eureka at our campsite at Long Key State Park. Steve, Cyndi, and Molly came to hang out too and took us to Key West for a little more fun. On our way back home, we had a little fun on the Pilar, practicing our Hemingway impressions. Captain, you’ll need to work on the beard I think. Back home we did a little more tweaking and final packing before we were off. Just in time to meet hurricane Hermine at the Florida/Georgia border. Fortunately, we only hit one band and managed to skate past the rest, before rain deluged the area. We arrived in Blairsville, Georgia after midnight and the first night out on our adventure was spent sleeping in a Walmart parking lot! And YES, there’s an app for that! It lists the Walmarts that allow overnight parking or not (ONP Walmart.) I called the store manager ahead of time to verify the ability to stay, and since we only needed a place to sleep and had places to go early the next morning, it was the perfect “free” campsite. Thanks Walmart, we appreciate it. Friday was a busy day, we met John and Janet at a local flea market and then went to breakfast. They showed us their property, which is for sale, and their cozy cabin. They have a nice relaxing place. We are really liking Blairsville. Smokin Jim’s Que, was what’s for lunch. We were so excited to to eat at our favorite place with the added bonus of sharing the time with former sailboat people. We forgave them for becoming land lubbers and had a great visit with Gary and Debbie. Their home under construction, in Hiawassee, is going to be so beautiful and Debbie has filled the foundations with scriptures, so it will be a blessing too. Glad they picked such a wonderful spot to plant themselves. Gary and Debbie also found us our second night’s camp ground, also a freebie, thanks to TVA. Lake Chatuge was a relaxing little roadside camp for the night. Late Saturday morning we made our way back to Blairsville, just in time for a Cuban lunch at Dan’s, with Rick and Jennifer. I know it’s a bit far from Miami, but this is gooooood food! Then we headed up to their cabin to unload the motorcycle and for Dave to arrive, at Rick and Jennifer’s cabin. We were ready for a week of riding and fun in the mountains. You know there was more Smokin Jim’s in store! And a ride to Cherokee and the Blue Ridge Parkway, with Rick and Jennifer, Dave and we met Don Curley, who led the way. Back at the cabin, the boys had a little bee problem that needed attention. This looks an awful lot like a Tom Sawyer and Huck Finn moment to me. The week was just getting rolling when the call from home came and Miss Nyah was not feeling very well. We had to go home and figure out what was up with our baby. This was a little glitch in our plan, but after vet visits and diagnosis, we decided to take her with us. Her diagnosis is most likely lymphoma, and her prognosis is unclear, but for now she is enjoying our trip and loving life, as only and Rhodesian Ridgeback can do. We are pretty sure, she just wanted to come along for the Short, Short Trailer adventure. Stay tuned…the adventure is under way…and it’s interfering with my ability to get blogs posted, so be patient! Thanks for following us. We left Manjack because we were about to sink the boat with dirty laundry. Some people air their dirty laundry, but not us…May I proudly present our clean laundry. One months worth. Done, folded and put away! As long as we were in Green Turtle to do a little (hmm) laundry, we found a nice cool place to get some wifi, make a few calls, pay bills and update the blogs. The Mountain Dew with ice was a bonus! After a few hours, we made our way on over to No Name. The winds were gentle so we stayed a few days to do a bit of snorkeling, diving, fishing and conching. We were quite successful all around. Here the Captain caught lunch and then some. With our dive tank and hoses, we can stay down longer to get close ups and practice our Go-Pro skills. Working on our Go-Pro skills. An early morning kayak paddle in the small bay inside No Name. On our second day out, we decided on some conching. The Captain is great at finding them. And I’m not too bad at cooking them. Not sure where we are headed from here, thanks for following along, I’m sure the next place will be just as beautiful.